European Cars are always a good idea. We show you some of our favourite European Classics from the upcoming Gosford Classic Car Museum Closure! European classics are known for their elegant lines, luxurious touches, superior handling and performance on the road. With a European car, comes a brand that is rich in history, class and style. Australian-sourced European cars often offer all of the benefits of European styling, but coming from Australia’s dry climate, they usually feature very little corrosion! Of course, the largest privately-owned classic car collection ever to be auctioned in the southern hemisphere is going to feature some extraordinary European classics. Over 40 of them in fact! This is a rare opportunity to see a collection of iconic names together Austin Healy, Mercedes-Benz, BMW and Skoda. We have chosen six of our favourites as a taster of what’s to come in this incredible auction. The Austin Healey 100/4 was a vehicle truly ahead of its time. Looking at this particular one is like looking at a time capsule. This is the vehicle that sets the benchmark for all restorations. It really proves the beauty of Austin Healeys. It’s powerful 90HP, 2.6L inline four-cylinder engine allows the car to easily reach 100mph! Driving this stunner feels strong and precise as the three-speed manual transmission with overdrive shifts effortlessly. This car features a matching interior and exterior in ‘Spruce’ Green, mounting plates that have been completely re-manufactured and wiring clips produced to the original specs. This vehicle has had no expense spared! These 100/4 models are extremely collectable, especially in this fantastically restored condition. This would make the ultimate addition to any classic collection! 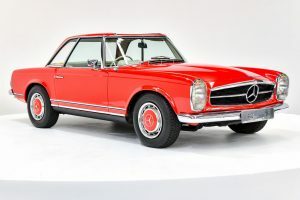 It is said that only 5,000 of these Mercedes-Benz 250SL Pagoda were produced between ’66 and ’68 which makes this Australian delivered car a rarity. Along with a few cosmetic changes, this Mercedes model offered an improved seat belt design, a collapsible steering column highlighted by a padded centre hub. With a 2.5L, six-cylinder engine powered by a 4-speed automatic transmission, this slick vehicle is proudly coated in a desirable red paint with a light cream parchment leather interior. Mercedes set the bar industry-wide with an interior design of luxury featuring a thick padded, fully instrumented dashboard and an inside cabin of high-class leather. It’s no wonder this luxury sports car is so highly sought after! This 250 SL is an investment with the odometer showing only 84,370kms. The Chaika is a luxury vehicle from the Soviet Union produced by Gaz. With exclusive manufacturing rights belonging to the Soviet Government, two generations of these limos were produced between 1959 and 1981. On rare occasions, these deluxe beauties were offered for hire to the public. Only 3,179 M13 models, such as this one, were ever made. With most of its life spent in Europe, in 2015 this vehicle made its way down under from the Czech Republic. This particular car is one of only several remaining in such great condition and boasts only 82,040kms against its durable 5.5L V8. The engine produces 145 kilowatts of power, pulled through a 3-speed automatic transmission. This 7-seater rarity flaunts its original condition of a gloss black exterior finished with chrome trim. The unrestored interior is testament to its class and luxury design and showcases a pre-1970 icon as it would have been when first released. With its limited production numbers and the mint condition it presents in now, this Chaika is a great investment. Produced by the Czech manufacturer, AZNP, the Skoda 110R is a unique and iconic Eastern European vehicle. Skodas have some quirky traits, they’ve tried and done it all! The Skoda 110 R is a rare and highly unique vehicle that boasts the classic 70’s Skoda design. Its sleek fastback shape and unusual, yet charming, front-end is highly distinctive and popular among collectors. This particular car has a 1.1L inline 4-cylinder engine fitted in the back of the car, paired with a 4-speed manual transmission that powers the rear wheels! It is in excellent working order and a total pleasure to drive which is a true testament to the simple mechanics of these vehicles. Skoda is a relatively new name to Australians but has been around for an extremely long time. One of these would be a great as a display piece in a present-day Skoda dealership to prove how established the make really is! This an excellent opportunity to own a milestone vehicle in Skoda’s history. At the launch, the BMW M5 was the fastest production sedan in the world and was labelled the first Super Sedan. Hand assembled by BMW Motorsport Division in Germany, this particular car is one of only 283 RHD M5s ever produced. It was imported from the UK in 2003 and presents in exceptional condition. Powered by a lively 3.5L inline six-cylinder paired to a 5-speed manual transmission, this Super Sedan can reach 100kph in just 6.2 seconds with a top speed of 245kph! This stunner presents in its original colour scheme of Lachssilber Metalic (Salmon Silver Metallic) over a black interior and features a sunroof, adding significantly to its desirability and collectability. This BMW’s aggressive, yet subtle, design featuring 16-inch cross-spoke alloy wheels and wide-body wheel-arch mouldings, has transcended generations and still turns heads today! Leading up to the Great Depression, Packard was a definite favourite of wealthy Americans, but could easily be mistaken for a European beauty! By the time this Custom Eight hit the market in 1930, Packard had been the top selling luxury brand for more than six years! A Packard was highly valued and treasured amongst film stars because of its glamorous style and quality for its time. This particular 740 Custom Eight Roadster is a fine example of old school luxury and is in pristine condition. It paves the way for a reliable investment and is still much loved and desired car. Restored to the highest standard, this beauty is still largely original and has been verified as a genuine cabriolet. She is powered by 6.3L straight-eight engine paired with a four-speed manual transmission and both are in outstanding mechanical order! Do not miss this unique opportunity to own a beautiful piece of motoring history.